Hello every one, Sara here again. How are you all doing this warm summer day? Despite last months earthquake and last weeks floods here in Kyoto it feels like Kyoto is recovering really good. The Kamo river is back to normal and so seems everything else as well. July is a really exciting month here in Kyoto. 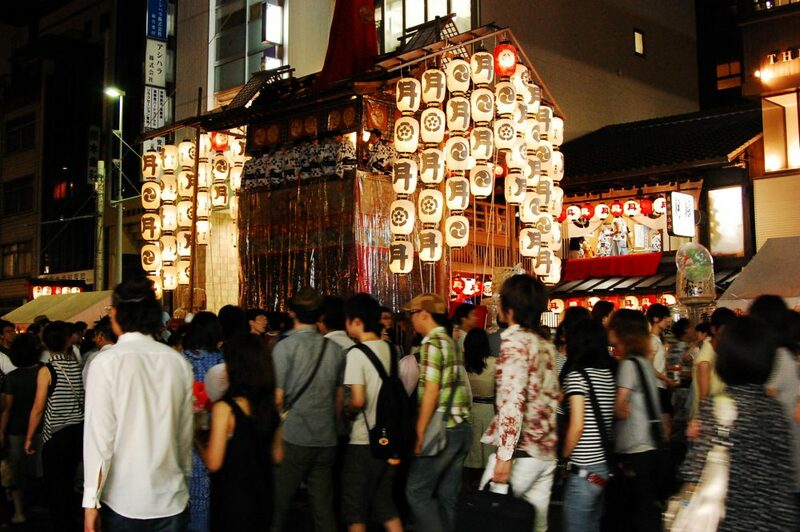 With start at the 1st there is the Gion matsuri (Gion festival). You can really feel it in the air, and along some streets they also play festival music. It is really nice to walk around surrounding yourself with all the culture. At the 15th and 16th they will close on of big main streets and open up food stands and much more. it is so fun and a really good way to try out food you may have not dared to try otherwise, and why not do it while wearing a yukata or a Kimono? The most exciting main event is the parade that will take place at 17th. A parade with traditional festival music and carrying around temple like carriages. It is a very majestic event. While here in Kyoto we at studio Miyabi will be open everyday waiting for you come and explore our world. About a ± 2 hours experience where you will get a really great omiyage (souvenir) to bring with you back home. And hands down, I promise you that all your friend will envy the beautiful Oiran photos that you can take here.